This exhibition celebrates the histories and art of Arthur Murch and Jurgis Miksevicius. It also reveals the work of their ‘keepers of the flames’, Michelle Murch and Carolyn Leigh. The empire and the living history of an artist ultimately become the bequest and responsibility of the family. Having lived with the artist, the family members are in a unique position to provide insights into the art and its production. Although these artists had very different backgrounds, there are common processes, priorities and problems faced by the inheritors of their diverse artworks. For Carolyn Leigh and Michelle Murch it is an absorbing and at times emotional voyage through the practicalities of managing the art legacies of their artist-fathers. They are bound to the artworks through love, respect and filial duty. MICHELLE MURCH (b. 1951) is the daughter of Arthur and Ria and sister to John. The Murch family lived in Avalon on the Northern Beaches, an environment which provided much figurative and landscape material for the artist. Michelle recalls an idyll – home life, the beach and bush – and a very close relationship with Arthur. During the 1950s and 1960s, Ria made the long trek via bus to the city each day to work to keep the family afloat while Arthur turned the home into his studio. He taught Michelle to read and write while he worked at his easel and introduced her to a wealth of ideas, processes and people. Ria championed the work of Arthur and wrote the biography – Arthur Murch, An Artist’s Life (Ruskin Rowe Press). CAROLYN LEIGH (b.1947) is the step-daughter of Jurgis, daughter of Elva and sister of Martyn and Helena. Elva and Jurgis built their home in Killara on the edge of the Lane Cove River Park where they lived from 1953 – 2004. Carolyn enjoyed, what felt to her, the magic of growing up in the midst of Jurgis’ creative activity. Inspired by an interview with Matisse’s son, she realised that it was important to document her father’s life and work and to collect his words and thoughts. Over the last 20 years of his life, Carolyn began to catalogue Jurgis’ artwork and to record conversations which she drew on for her book, Jurgis Miksevicius – Portraits Real and Imagined. The accompanying film was commissioned for this exhibition and produced by Catherine Hunter Productions. Thank you to Catherine Hunter, Bruce Inglis, Carolyn Leigh and Michelle Murch. Michelle and Carolyn will be joined by other ‘keepers of the flame’, Cassi Plate (Carl Plate) and Meg Stewart (Margaret Coen), in conversation with Katrina Strickland, author of Affairs of the Art and editor of Good Weekend, about living with artists’ legacies. Michelle Murch and Carolyn Leigh share the stories of Arthur Murch and Jurgis Miksevicius as told through the artworks in the exhibition and archives. Images: Jurgis Miksevicius in his Killara studio, 2004. 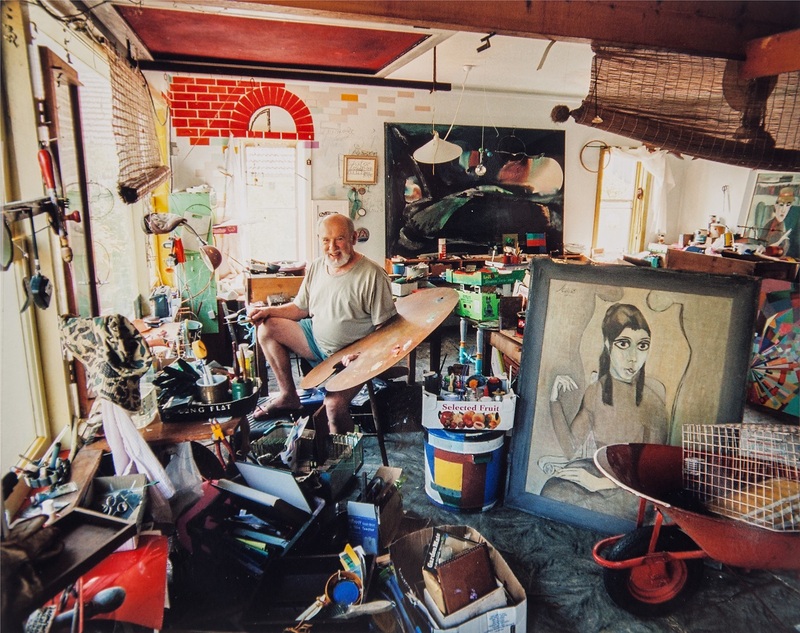 Photo by Rodney Weidland, and Jurgis Miksevicius in his Killara studio, 2004. Photo by Rodney Weidland.